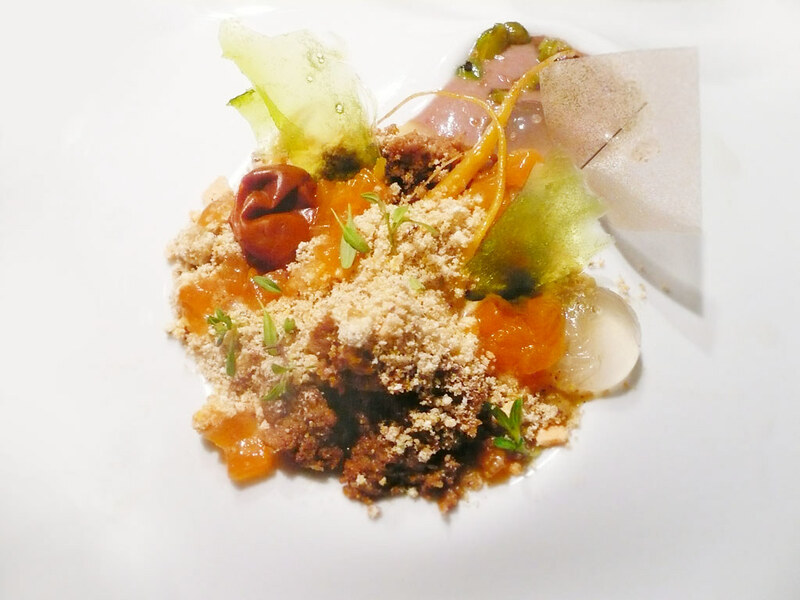 Persimmon, Aroma Strip, Carrot, Red Curry – Alinea Restaurant recipe, pages 284-289. This three-day recipe from the Alinea Restaurant cook book is worth the trouble if you want to take it on. Cake and ice cream! But I’ve never boiled a cake before! 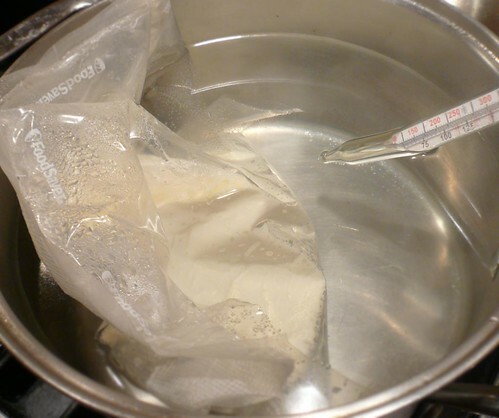 You’re supposed to cook the cake in a bag en sous vide. When I tried it, the cake turned out more like oatmeal. So I ended up steaming it for several more hours, just like I do for the Christmas pudding. Now, that worked for me. I don’t use persimmons. I regularly pass them by at the local Asian markets. Never tried them, don’t know why the hell not. 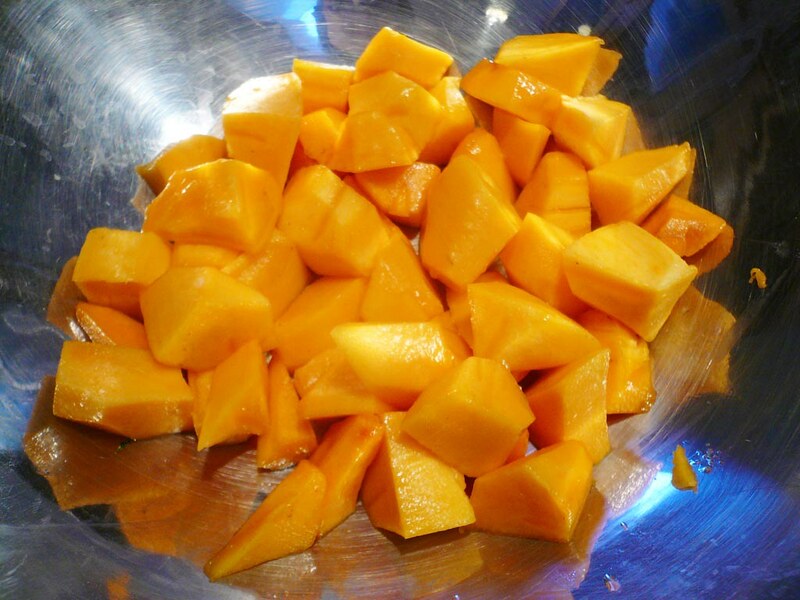 They’re a very naaaaice… This year at the farmer’s markets, they were quite plentiful, so I decided to give this recipe a try. 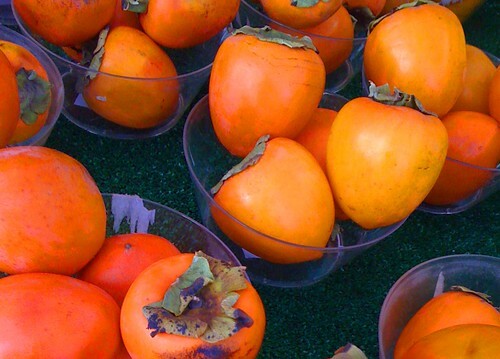 This recipe uses two popular types of persimmons (Diospyros). 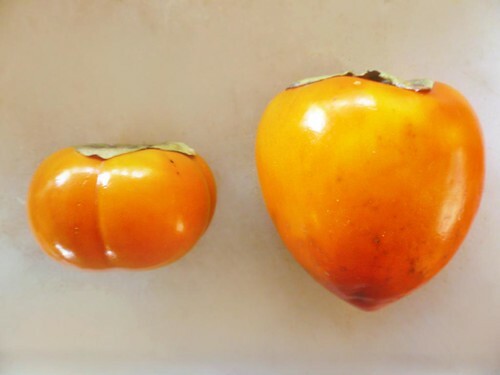 Fuyu (the smaller, squat japanese cultivar) and Hachiya (the larger, more bitter fruit). 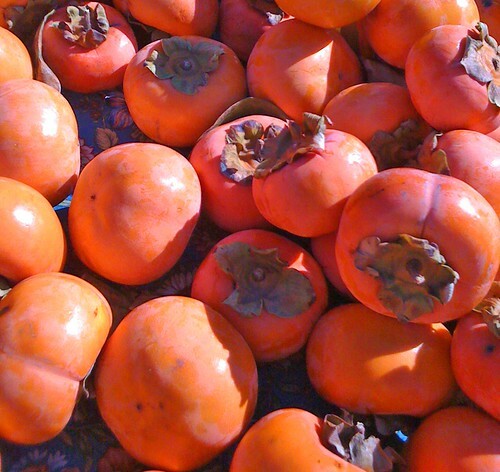 Hachiya persimmons are considered astringent, while the Fuyu are non-astringent. Meaning the high tannin content in persimmons makes them bitter, or “furry tasting” (astringent) when unripe. After they completely ripen to a soft jelly-like feel, the tannins break down, and they become sweeter (non-astringent). 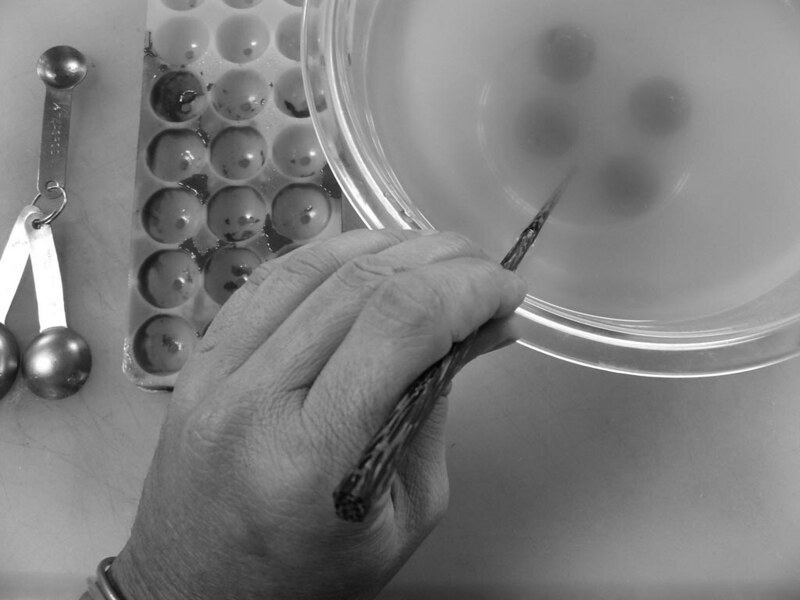 The Fuyus have much less soluble tannins to begin with, so they taste sweeter and are more edible from the get-go. Fuyu (on the left) and Hachiya (right) persimmons. This recipe also calls for pistachio flour. I did not find any locally. But I must admit, I didn’t try very hard. 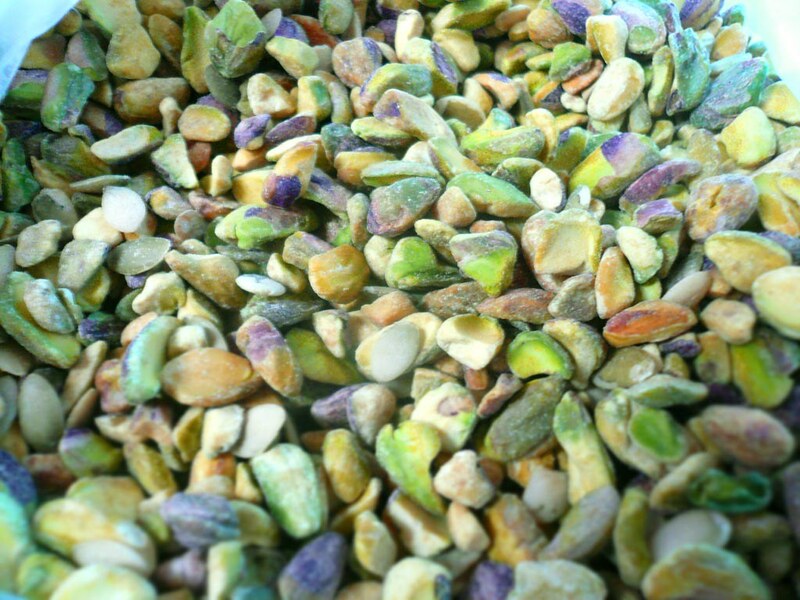 I toasted some raw, unsalted California pistachios from Trader Joe’s. 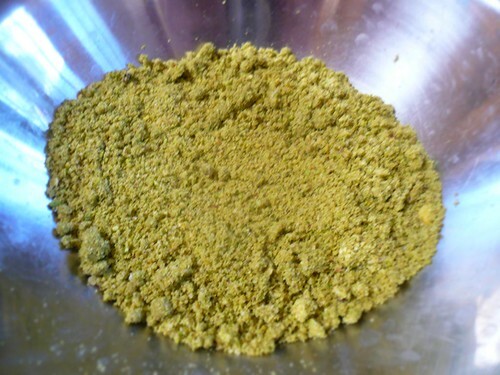 Then ground them up as finely as I could in the food processor. I substituted the ground pistachios for the pistachio flour. 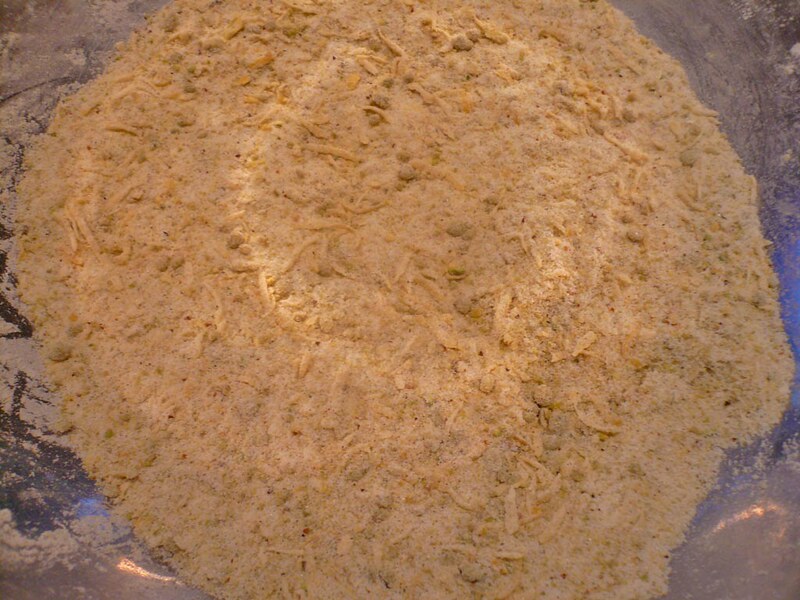 If you want to wait for it, you can order pistachio flour online, here. 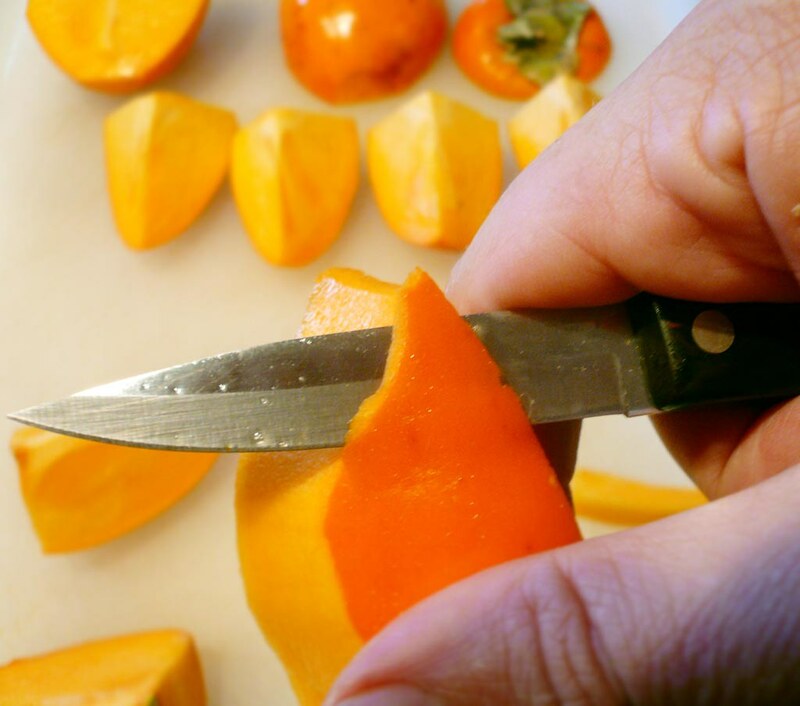 I peeled, quartered, then diced the persimmons. Then puréed them in the blender until smooth, strained, and reserved to my prep area. This recipe calls for the seeds of a vanilla been. 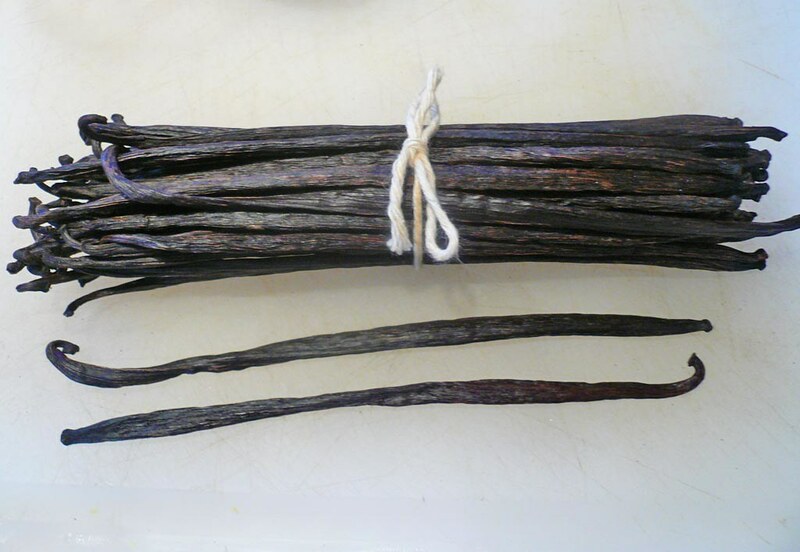 Easy to do if you never have before: Slice the vanilla bean in half, lengthwise. Take the flat side of a knife and draw it across the been, scraping out the teeny, tiny seeds. KEEP the bean and use it for other uses. 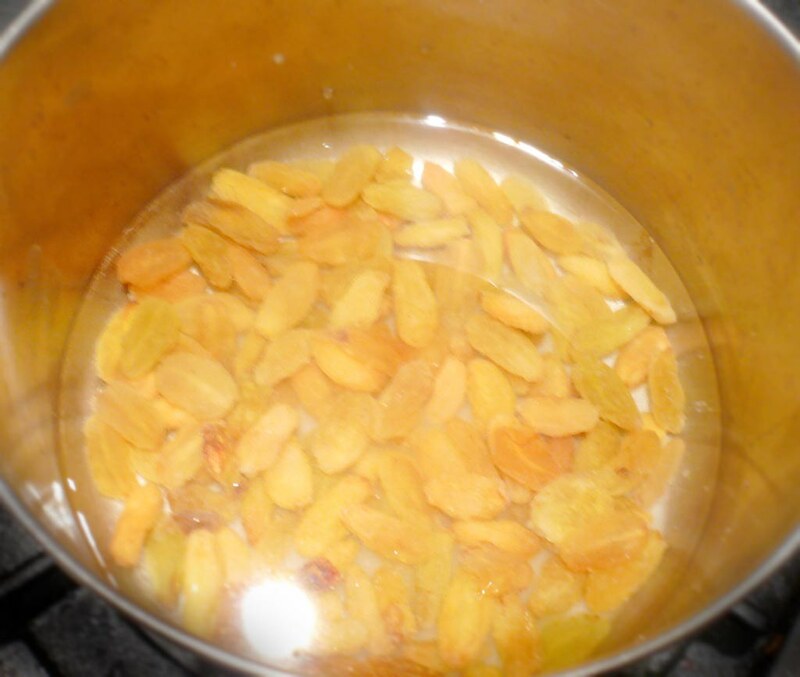 I heat mine some milk with honey, orange zest, and white chocolate. I also grated some Meyer lemon zest and nutmeg and reserved to my prep area. 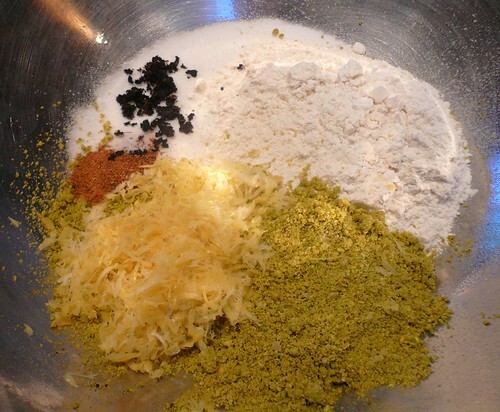 I mixed the flours, sugar, lemon zest, grated nutmeg, vanilla seeds and a little salt together in a stainless bowl. Then beat and mixed in the egg whites, persimmon purée and melted butter. I coated the inside of a vacuum bag with PAM, then sealed the persimmon batter in it my FoodSaver Vacuum Sealer, and brought a large pot of water to 200ºF. Then cooked it en sous vide for 3 hours. 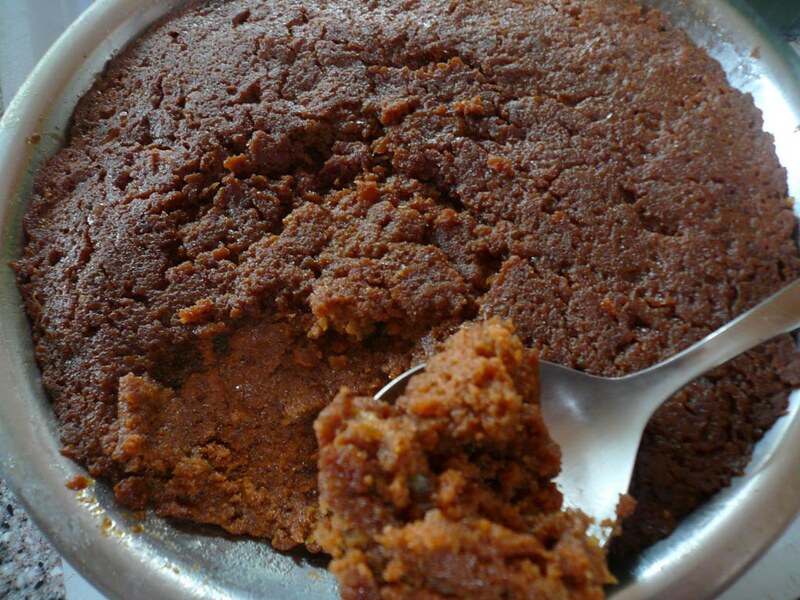 It still looked liquidy and bubbly inside, so I cooked it some more. Nope. Still not cakey enough for me. So I transferred the moist cakemass to a stainless bowl, wrapped the top with a layer of wax paper, then aluminum foil, and tied it all up with kitchen twine. 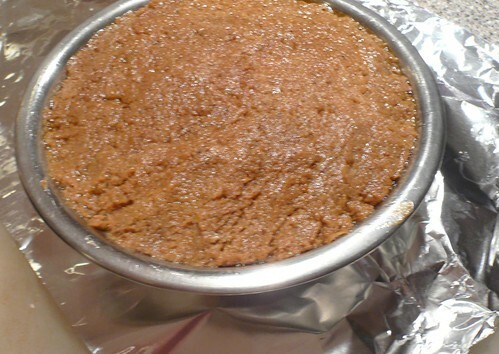 Poured out most of the water from the big pot, as I was going to re-use it as a “bain marie” for steaming the cake. Then lowered the stainless bowl into the steamer. Let simmer and steam for about three more hours. I found some California pistachios at the local Trader Joe’s, rather than searching all over for Iranian pistachios. 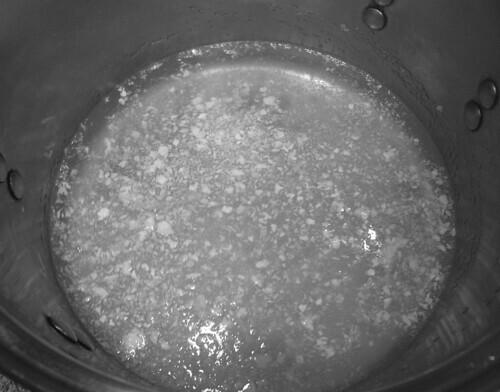 In a medium saucepan, I combined the sugar, honey, water a dash of salt and brought them to a boil. Then refrigerated this “holding” syrup until it was cold. 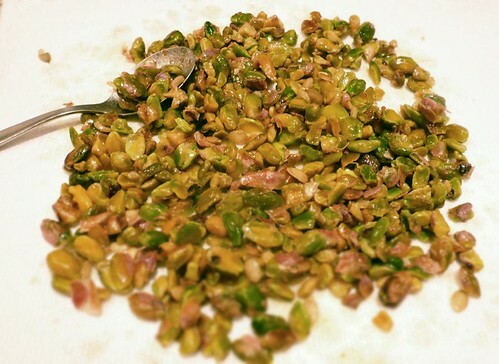 I combined the pistachios with some water, pistachio oil and a dash of salt, then brought to a boil. 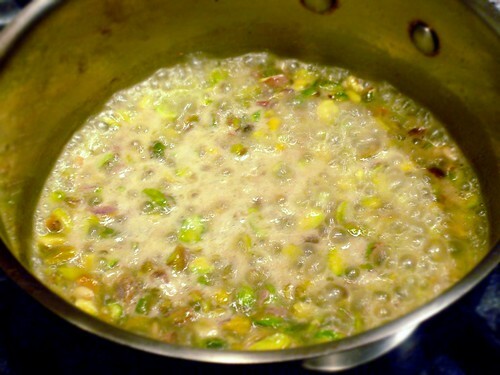 I reduced the heat and simmered the nuts until they were tender, about 15-20 minutes. …and reserved them to a plastic container of the “holding” syrup. You know, verjus (ver ZHOO) is one of those ingredients we keep hearing chefs on TV talking about, but don’t really ever see it, use it, or even know what it is. Grape juice. Well, I might be simplifying a bit here, but yes, it’s just sour grape juice. 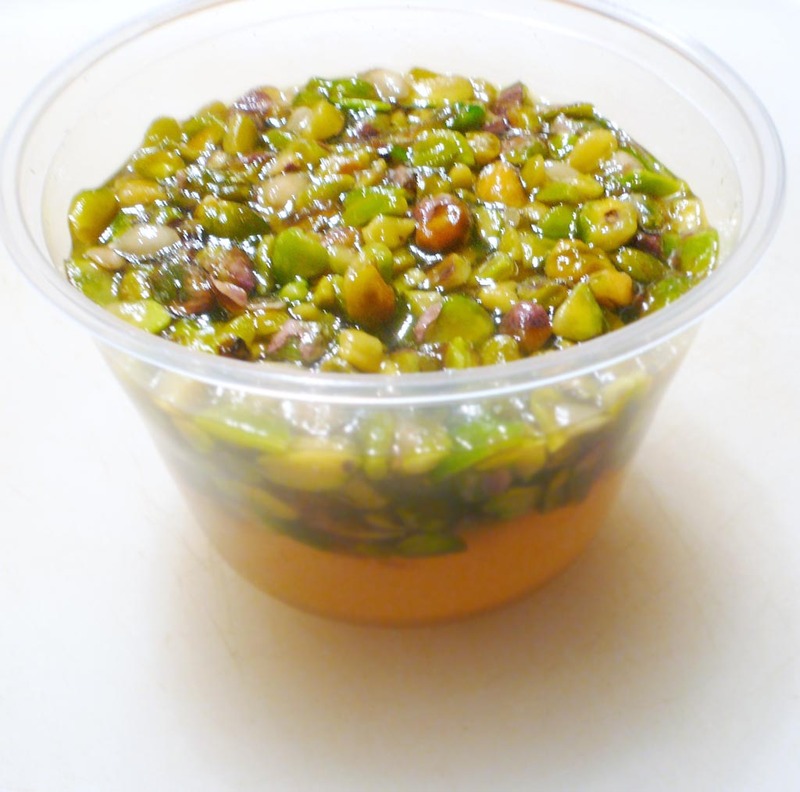 To be more precise, the juice pressed from unripe grapes, and sometimes apples. It can be made from any kind of grapes: semillon, cabernet, etc. 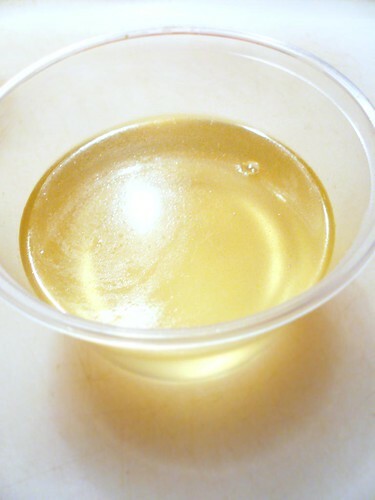 It’s used in place of vinegar, as it’s less acidic, but yet retains vinegar’s sourness. You can usually substitute lemon juice and vinegar in place of verjus in recipes. 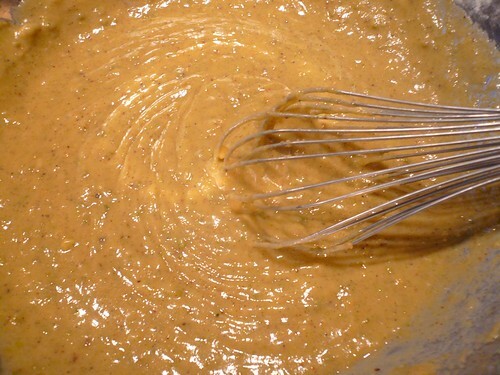 But not in this recipe — it just wouldn’t be right! I picked up a bottle of verjus blanc at Specialty Produce. I combined the ingredients in a medium bowl and simmered for about 10 minutes. 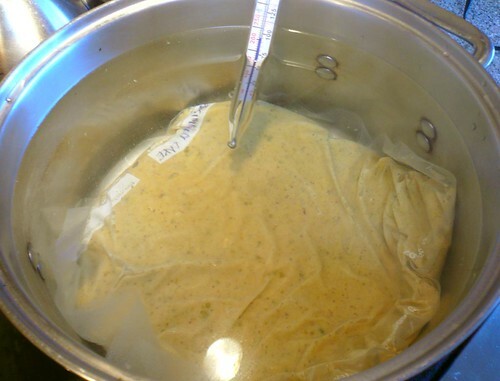 Then blended and strained back into another clean pan, and heated. 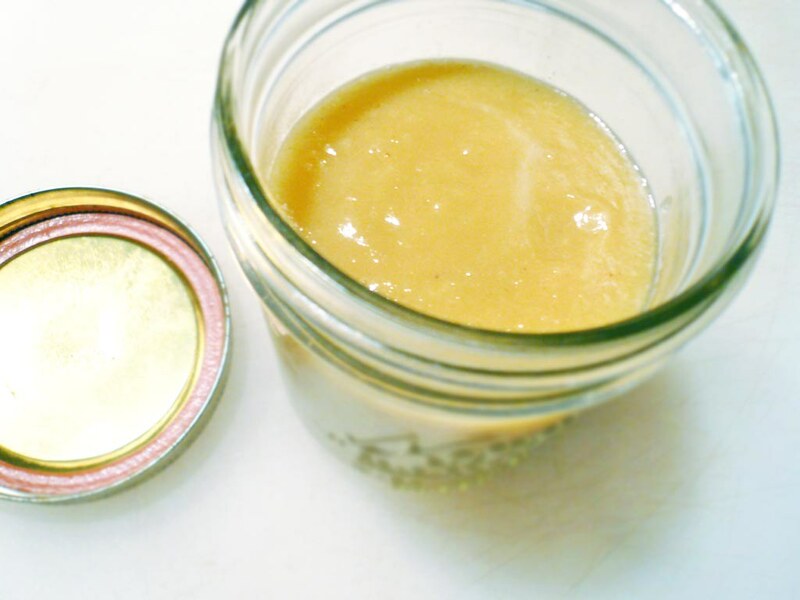 Mixed in cubes of butter to emulsify. Then reserved to my prep area. 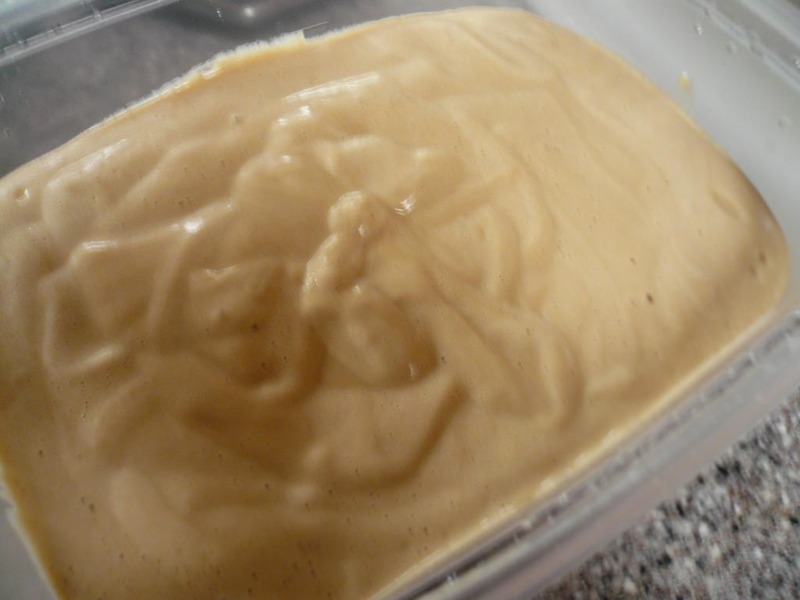 This is like making Mexican dulce de leche, or ice cream with condensed milk. 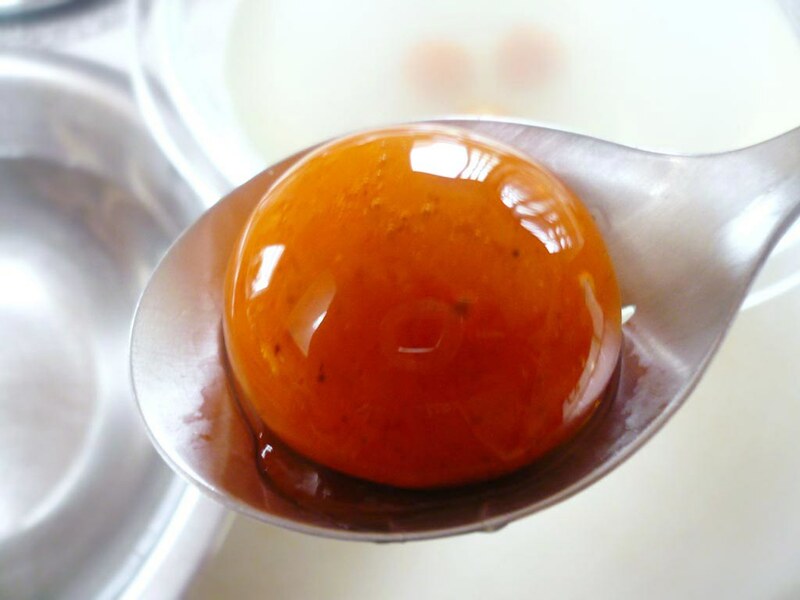 When you cook it very slowly en sous vide, the sugars in the milk and honey caramelize, creating a warm, golden-colored goodness! I have never found Louis François STAB 2000 ice cream stabilizer for sale here in the U.S. I know it must be hiding somewhere, but have yet to find the damn stuff. But I did find STABI 3000 ice cream stabilizer online at L’Epicerie. The have STABI 3000 for ice creams and STABI 3000 for sorbets. 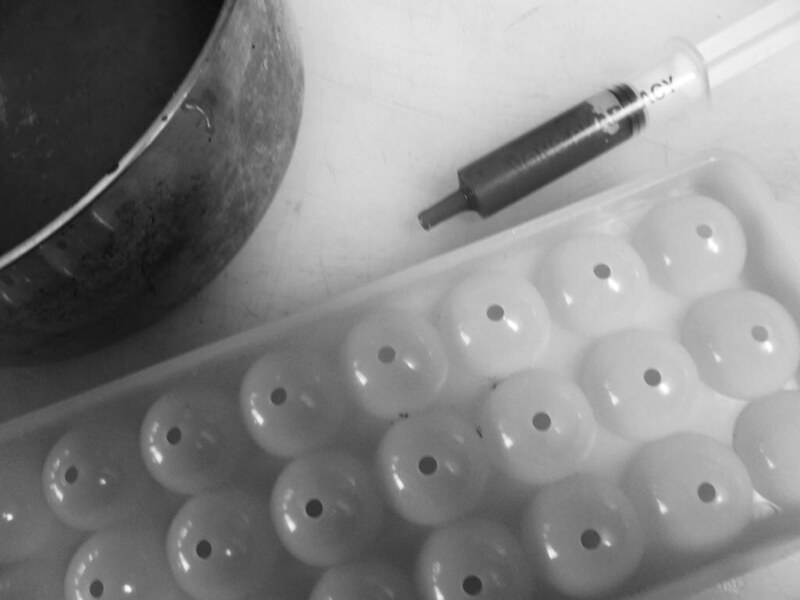 I get a lot of hydrocolloids from them — I like their reasonable prices and prompt service. I mixed the half-and-half, whole milk and honey in a stainless bowl. 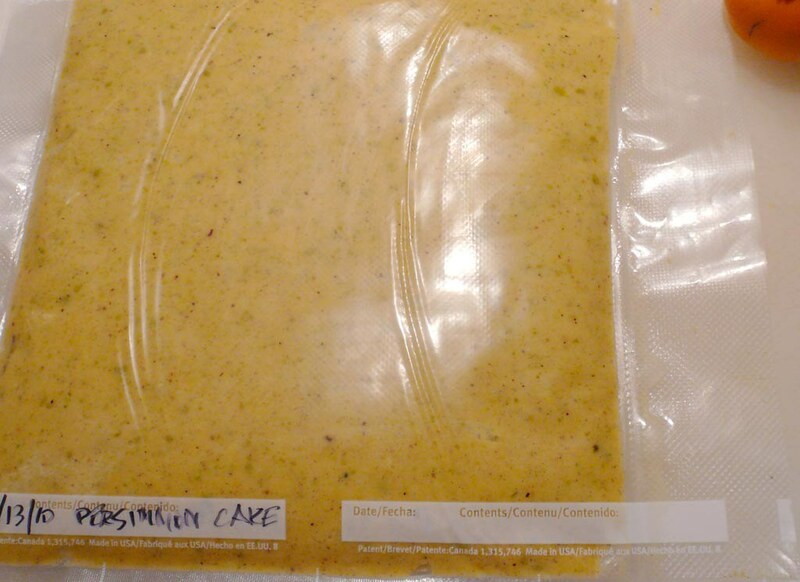 Transferred to a bag and sealed up with my FoodSaver vacuum sealer. 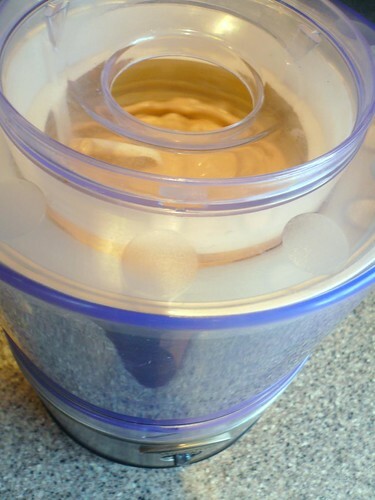 I don’t have a Pacojet freezer/blender, so I’m using my good ‘ol electric ice cream maker. 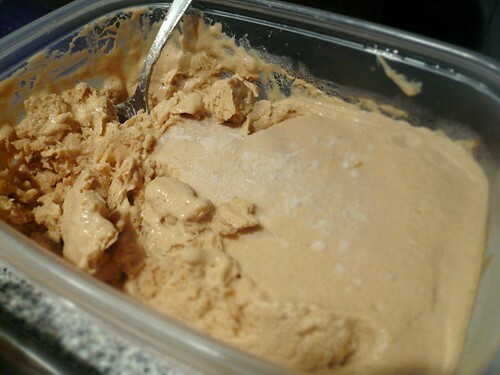 So while I was thinking of it, I put the drum of the ice cream maker in the freezer. I cooked en sous vide at 175ºF for twelve (start this early in the day!) 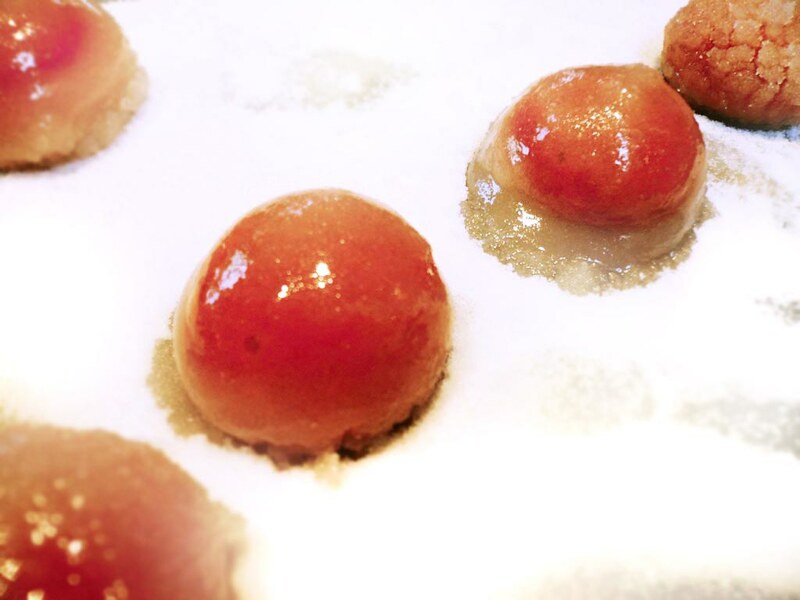 hours, until the honey and sugar had caramelized. Blended with the ice cream stabilizer. 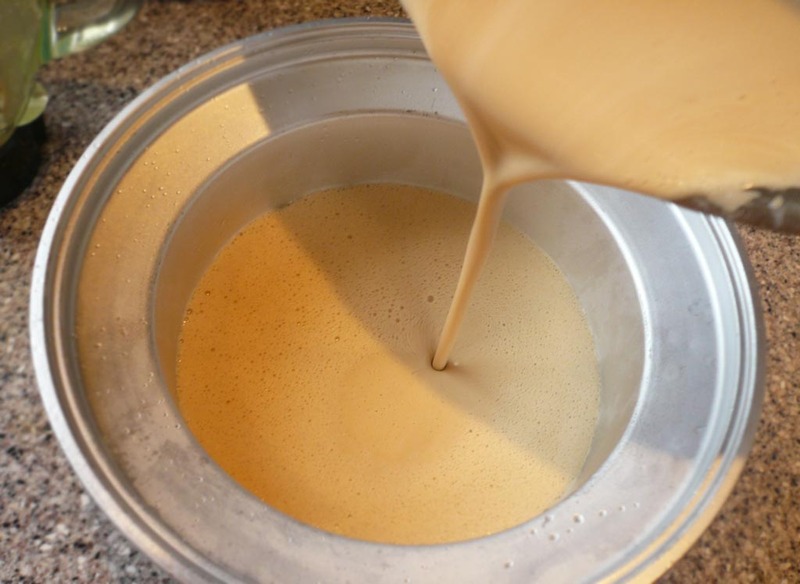 Cooking the imparted a golden color to the ice cream “custard” mix, as you can see when I transferred it to the ice cream maker. Churned the ice cream mix until the motor slowed down a bit then finished it off in the freezer. 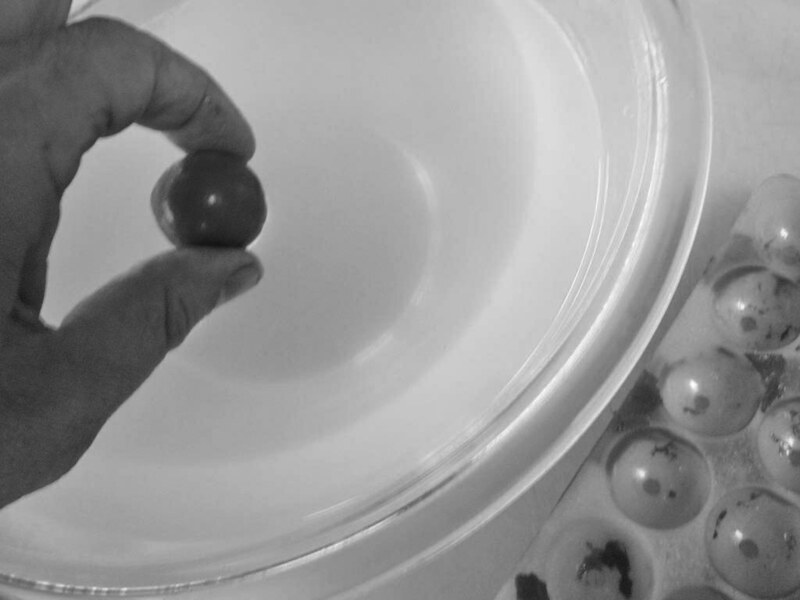 These start as spheres of liquid red curry, which you then dehydrate down to a wrinkled “raisin” shape. For the carrot juice, I juiced a bunch of fresh carrots in my Breville Juicer. 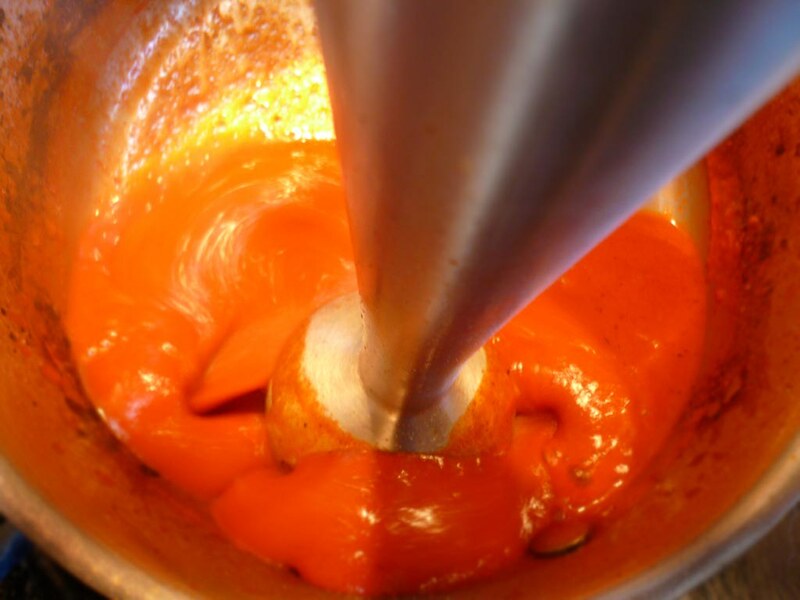 I combined some red curry paste, carrot juice and sugar in a medium saucepan, and brought to a boil. I slowly added the xanthan gum and calcium lactate into the juice, then blended with an immersion blender. Blended vigorously until the powders were as fully incorporated as possible, then strained the liquid with a chinois. I’m glad I did, there were a bunch of starchy globules from the gum! Spherical mold for the raisin balls. Children’s medicine syringe from the pharmacy. 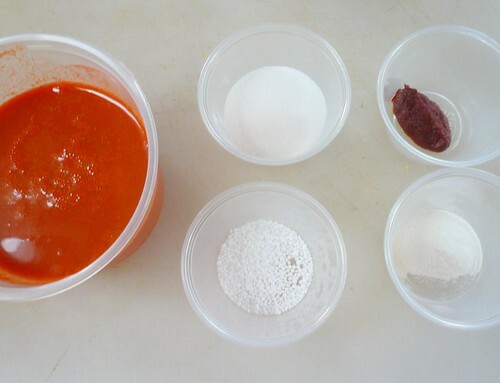 I filled the molds up with sauce. Then froze solid. 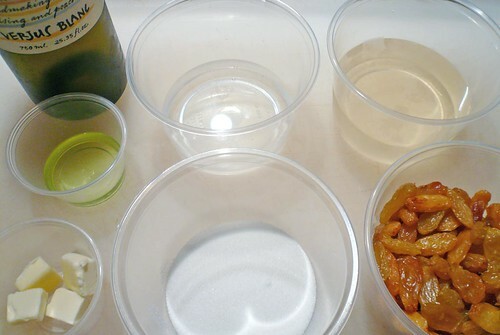 Mise en place for making the alginate bath. I combined some water, sugar and sodium alginate in a medium saucepan and brought to a boil to dissolve the solids. 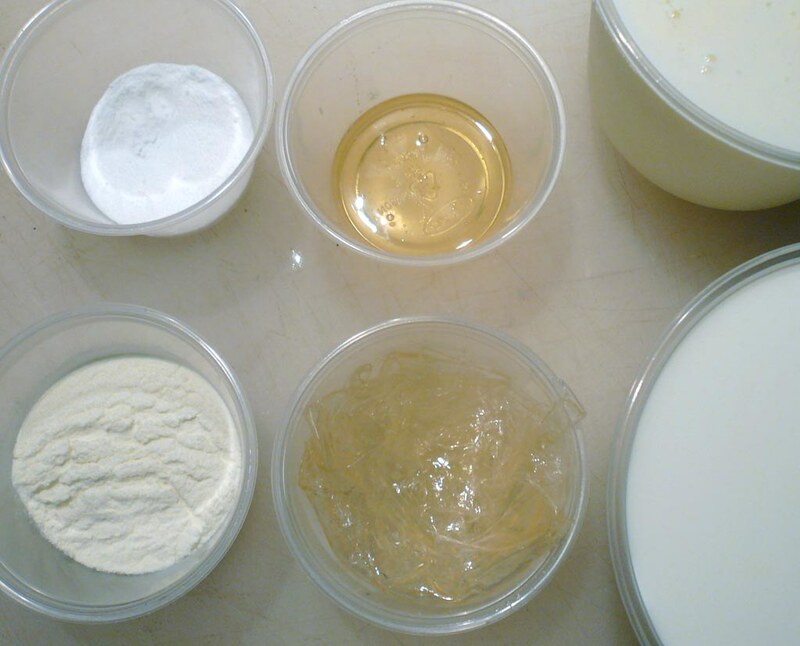 Mixed liquid with an immersion blender and strained into a glass bowl. 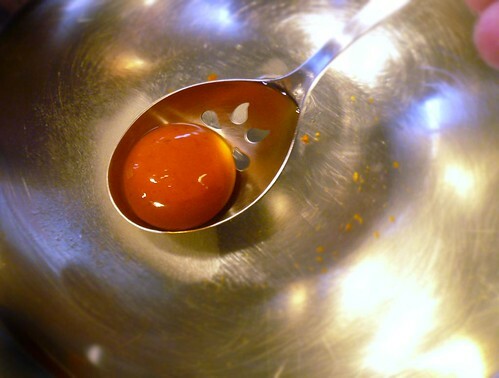 The liquid started to gel a bit as I waited for the curry spheres to freeze. Thickened up to an almost H.R.Giger-alien-slime texture… I removed the mold from the freezer and was ready for spherification! 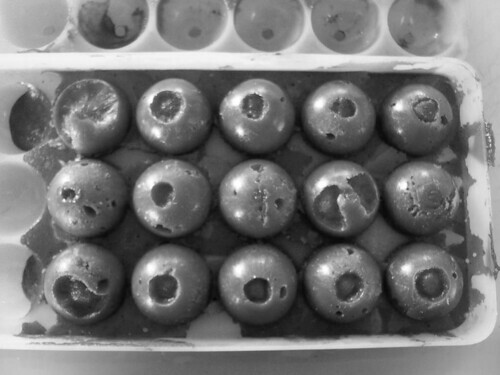 The frozen curry spheres had some imperfections, which were easy to fix. 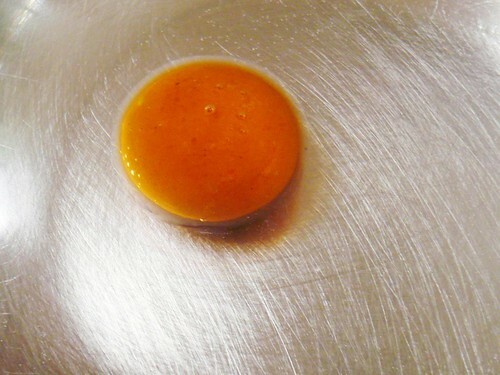 When I took a little of the curry, the heat from my fingers melted it enough to fill in the dents. I also smoothed out the rough seam edges from where the mold came together. 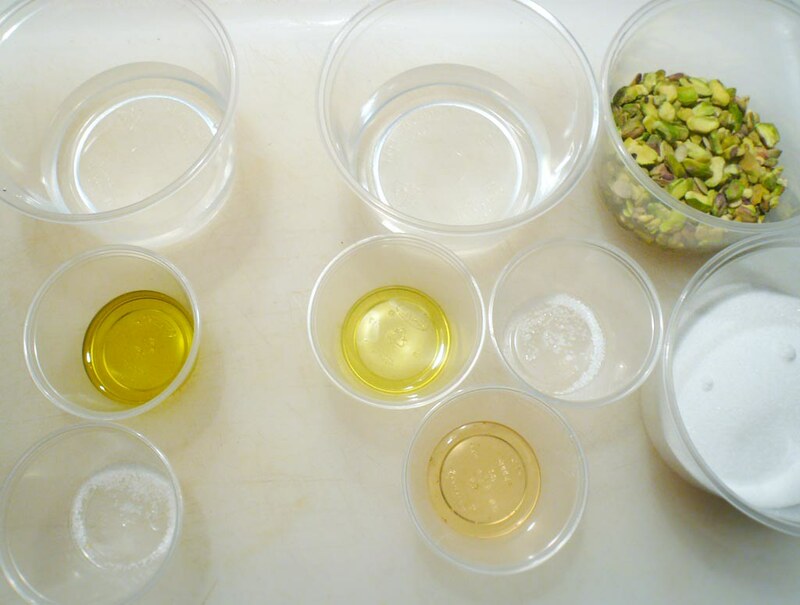 Hey Kids, It’s Science Lab in the Kitchen! To “harden” the curry spheres, you drop them into the warm alginate bath and wait until they thaw. As they do, a clear layer gelatinizes over their surfaces, encapsulating the liquid centers. I made sure to do only a few at a time, and kept them from touching as they did their thing. It’s so cool! I love this. This technique is getting more common in restaurants. 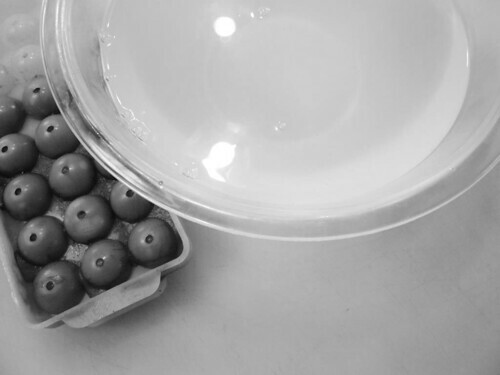 At The Bazaar by José Andrés in L.A. they have a dish called caprese new way which uses liquid mozzarella spheres (kinda like a burrata). Yum! If you go, make sure to sit at the bar. 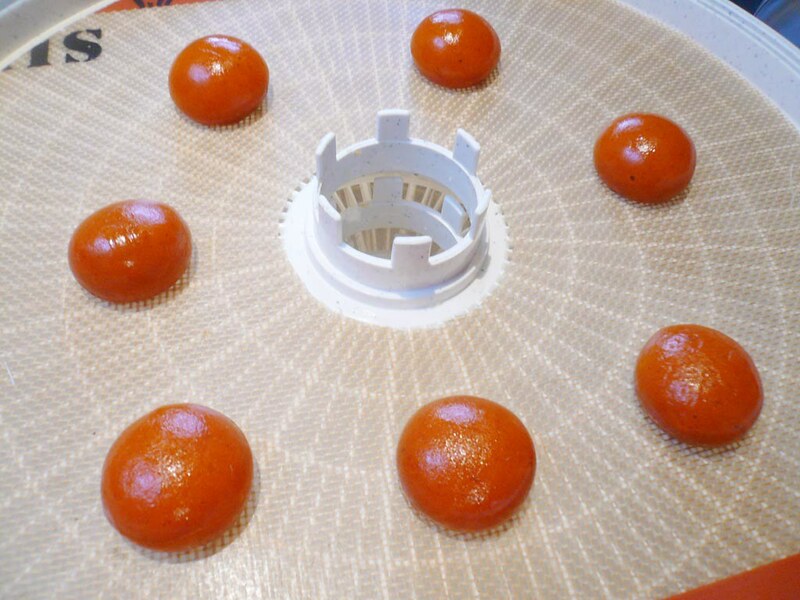 You can watch the sous chefs preparing the spheres, and all their other delightful “molecular” tapas! 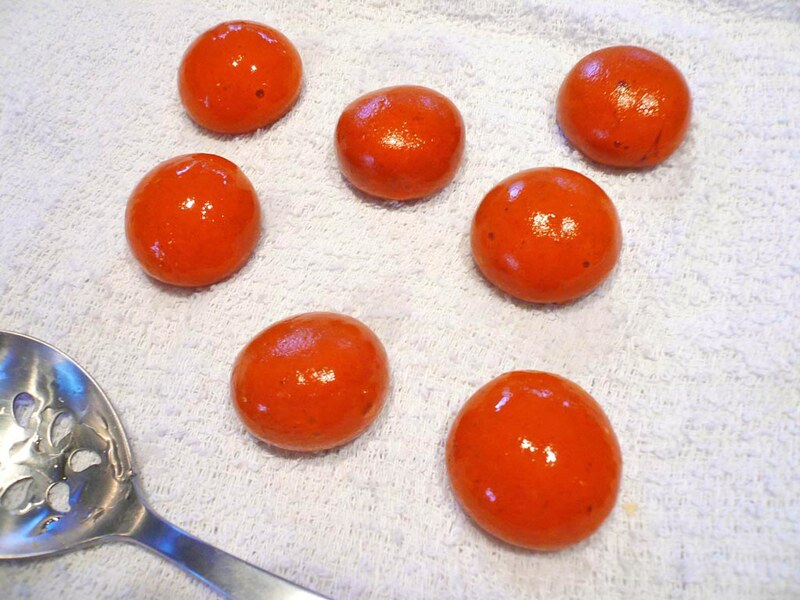 This is what the delicate red curry spheres look like when removed from the alginate bath. 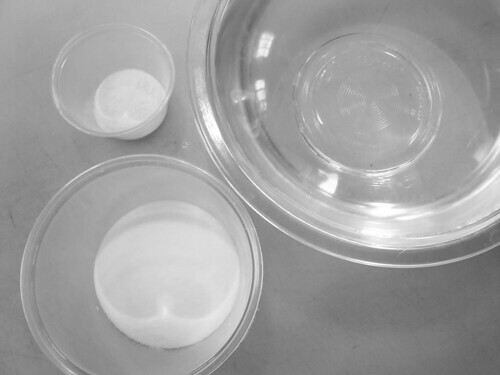 I took them out of the alginate with a slotted spoon, and gently rinsed them in a cold water bath. Then covered them in sugar on a prepared sheet tray to “cure”. 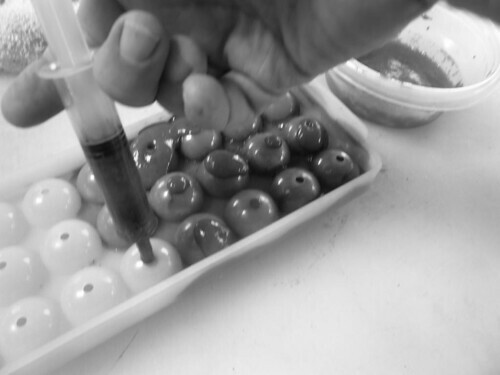 Once they’d cured, I removed them and rinsed off the sugar. And let them drain on a towel while I finished the rest. 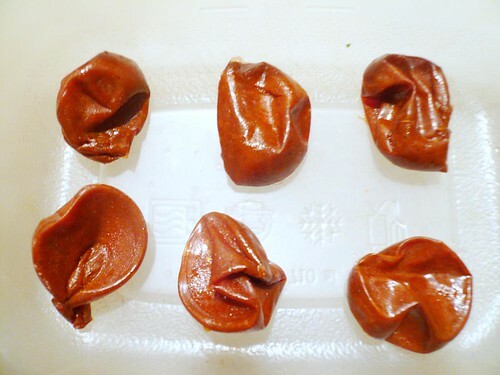 Then dehydrated at 130ºF for 6 hours on a tray lined with a nonstick silicone matte. Every so often, I’d check on them. And turn them over, so they didn’t stick. * Curtiss and Anne Anderson, “Christmas Back Where We Had Never Been,” Victoria,5:12, Dec 1991, pg 108. 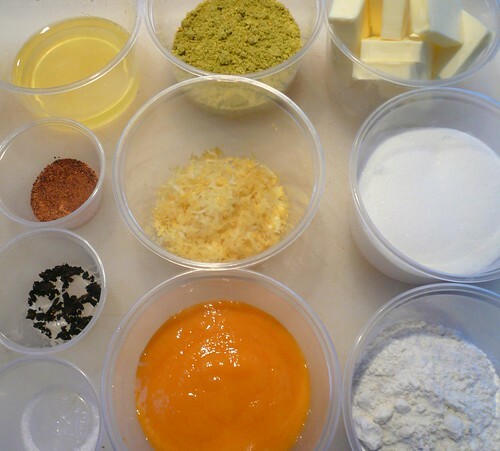 Christmas pudding recipe by Lucknam Park Hotel chefs Michael Womersly and Jane Garrard.